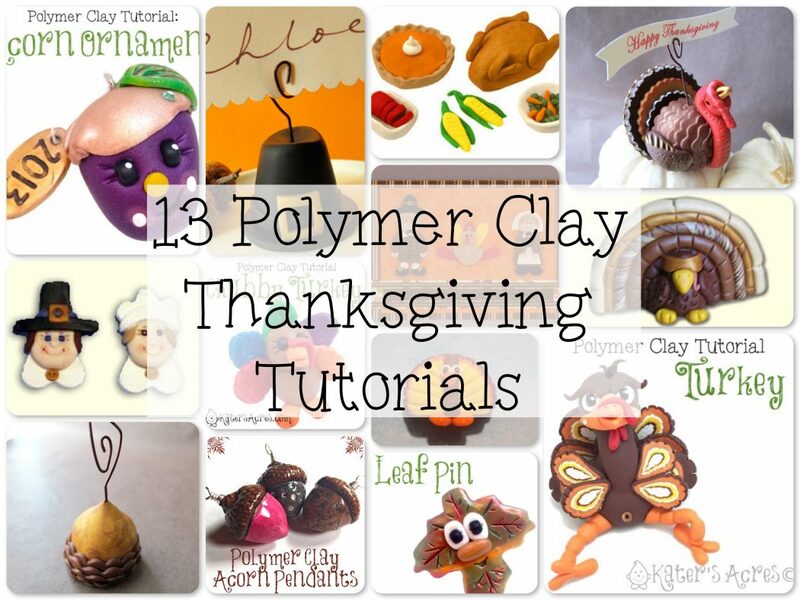 Have you ever noticed that polymer clay Thanksgiving tutorials aren’t that easy to find? Why is that? Well mostly because Thanksgiving is an American holiday, therefore only tutorial writers in the USA are likely to write tutorials for this holiday. Next week (if all goes well), I will bring you another last minute (yet cute) tutorial to help you with your Thanksgiving tablescapes. When you visit these tutorials, if it is a free tutorial, please leave a note of THANKS on the blog or website to let them know you appreciate their hard work. Whimsical Acorn Ornament (2 Part Tutorial) by KatersAcres. Repin Here. Pilgrim Hat Place Card Holder from Polyform. Repin Here. Miniature Thanksgiving Day Food Items from Polyform. Repin Here. Realistic Polymer Clay Turkey from Polyform. Repin Here. Pilgrim Brooches from Polyform. Repin Here. Miniature Whimsical Turkey by KatersAcres. Repin Here. Thanksgiving Day Card from Polyform. Repin Here. Miniature Turkey Refrigerator Magnet by Shay’s Clay. Repin Here. Incognito Turkey Figurine from Polyform. Repin Here. Realistic Acorn Place Card Holder from Polyform. Repin Here. Realistic Acorn Pendants by Stepping Thru Crazy. Repin Here. Leaf Pin by KatersAcres. Repin Here. Whimsical Turkey by KatersAcres. Repin Here. Previous post: Do You Ever Wonder Where to Start?